Randy Finch's Film Blog: Twitter Ads: The Future of Social Media Marketing? Twitter Ads: The Future of Social Media Marketing? In September 2011, Electronic Arts (EA) rolled out a new soccer video game - FIFA 12 - using Twitter's promoted tweets method to kick off a social media marketing campaign. Statistics reported by Marketing Magazine suggest the promoted EA tweets reached unprecedented engagement level (although the metrics for measuring "engagement" with tweets are still being worked out). Daniel Brown, associate director at MediaCom, the agency behind the FIFA 12 campaign on Twitter, has said that the Twitter buy ‘exceeded expectations’ in terms of engagement. According to Brown, the key to the campaign's success was "time-sensitive ads with a ‘call to action’." This is potentially big news for anyone thinking about how to use social media as part of a marketing campaign (including microbudget filmmakers). Until recently, Twitter's ability to reach customers via promoted campaigns has been an open question. In fact, doubts about Twitter have run very deep in traditional marketing circles - extending all the way to questions about Twitter's basic ability to generate any revenue at all. Until now (Nov. 2011), Twitter revenue model skeptics have had the numbers on their side. As of Nov. 2011, Twitter has still not collected much money from advertisers. When compared to other social media titans like Facebook (projected 2011 revenue of $4.27 billion), Twitter (reportedly on track for $140 million in revenue in 2011) is just an "also ran." But that imbalance may be changing. 2012 may be a landmark year for Twitter as large corporate sponsors figure out (and start spending on?) the promoted tweet platform - and other big spenders, (like political candidates) start employing Twitter's ability to spark conversations in real time. Currently, Twitter charges for ads by "engagement" (clicks, replies, retweets or follows). The idea is that a sponsored tweet will spark a conversation. In this model, Twitter only stands to make big money when (if?) the promoted tweets go viral. And that's exactly what happened when EA decided to promote their new soccer game via Twitter: For example, EA started a "#fifasundays" promoted trend on October 2nd, 2011 - to coincide with the Tottenham vs Arsenal match - and that hashtag showed up in thousands of conversations within minutes. The success of the FIFA 12 campaign (admittedly built on a brand that already had a huge following) may be one of a kind. 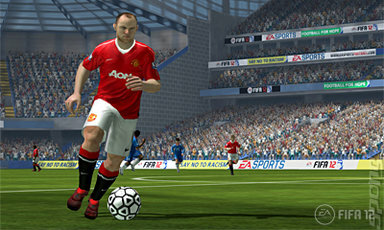 But the FIFA 12 campaign might also be a signpost pointing to Twitter as a powerful new tool in social media marketing. Keep watching this space - in the next year we may know whether Twitter has cracked "the code on allowing advertisers to create genuine social media conversations" or not.